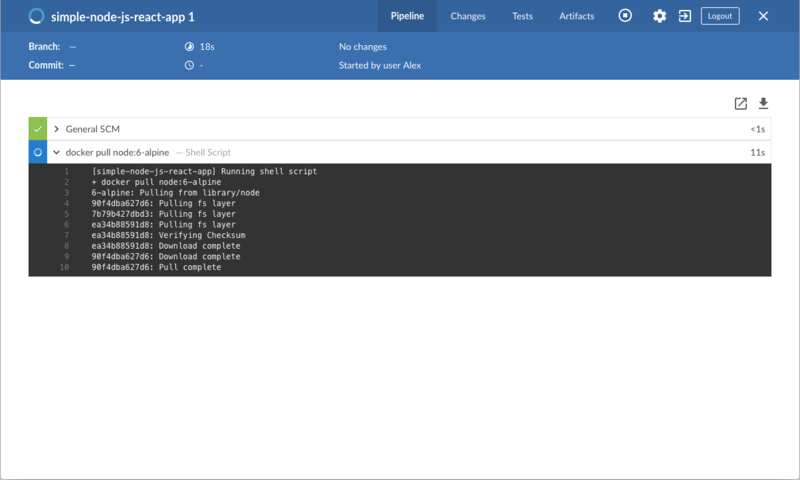 This tutorial shows you how to use Jenkins to orchestrate building a simple Node.js and React application with the Node Package Manager (npm). 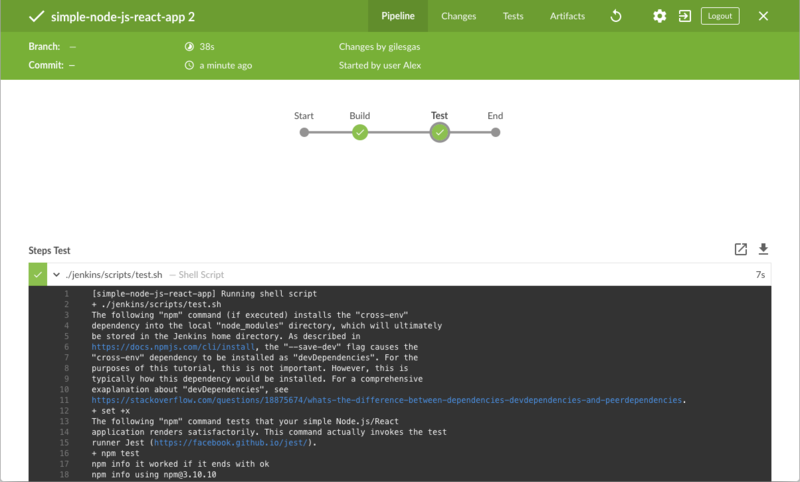 If you are a Node.js and React developer who is new to CI/CD concepts, or you might be familiar with these concepts but don’t know how to implement building your application using Jenkins, then this tutorial is for you. The simple Node.js and React application (which you’ll obtain from a sample repository on GitHub) generates a web page with the content "Welcome to React" and is accompanied by a test to check that the application renders satisfactorily. Git and optionally GitHub Desktop. Obtain the simple "Welcome to React" Node.js and React application from GitHub, by forking the sample repository of the application’s source code into your own GitHub account and then cloning this fork locally. Fork the simple-node-js-react-npm-app on GitHub into your local GitHub account. If you need help with this process, refer to the Fork A Repo documentation on the GitHub website for more information. In the Enter an item name field, specify the name for your new Pipeline project (e.g. simple-node-js-react-npm-app). 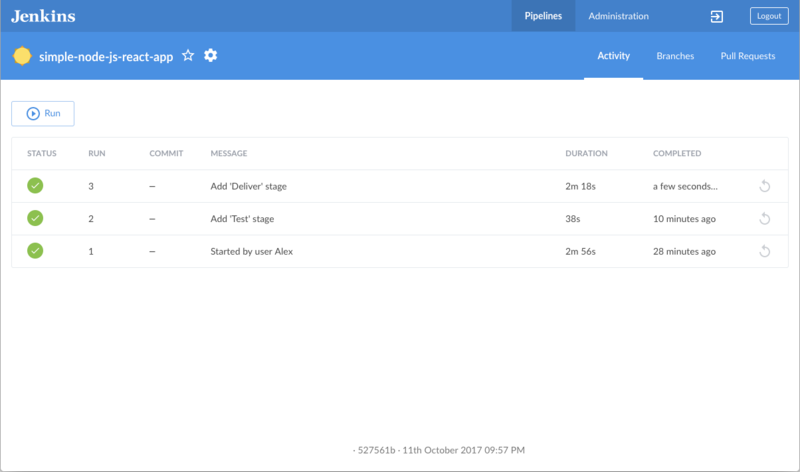 You’re now ready to create your Pipeline that will automate building your Node.js and React application in Jenkins. Your Pipeline will be created as a Jenkinsfile, which will be committed to your locally cloned Git repository (simple-node-js-react-npm-app). 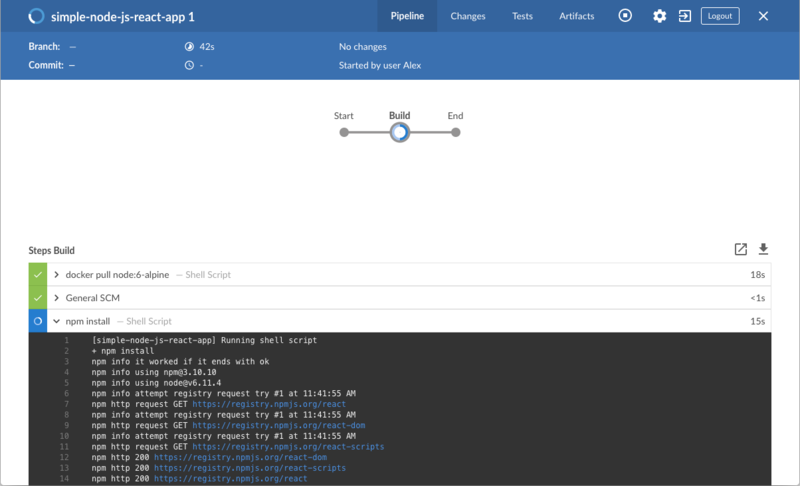 This is the foundation of "Pipeline-as-Code", which treats the continuous delivery pipeline as a part of the application to be versioned and reviewed like any other code. Read more about Pipeline and what a Jenkinsfile is in the Pipeline and Using a Jenkinsfile sections of the User Handbook. First, create an initial Pipeline to download a Node Docker image and run it as a Docker container (which will build your simple Node.js and React application). Also add a "Build" stage to the Pipeline that begins orchestrating this whole process. Using your favorite text editor or IDE, create and save new text file with the name Jenkinsfile at the root of your local simple-node-js-react-npm-app Git repository. You’ll have separate Jenkins and Node containers running locally in Docker. 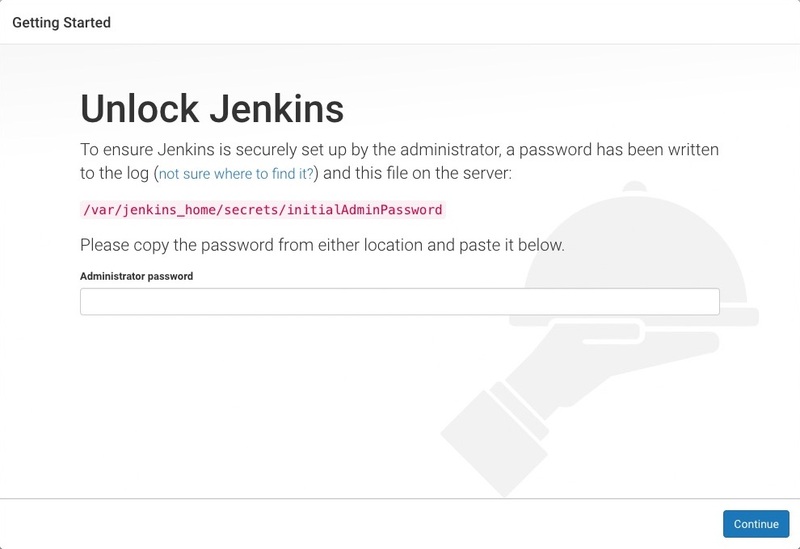 The Node container becomes the agent that Jenkins uses to run your Pipeline project. However, this container is short-lived - its lifespan is only that of the duration of your Pipeline’s execution. 2 This args parameter makes the Node container (temporarily) accessible through port 3000. The significance of this is explained in the jenkins/scripts/deliver.sh file of your cloned repository, and is covered in a subsequent section of this tutorial. 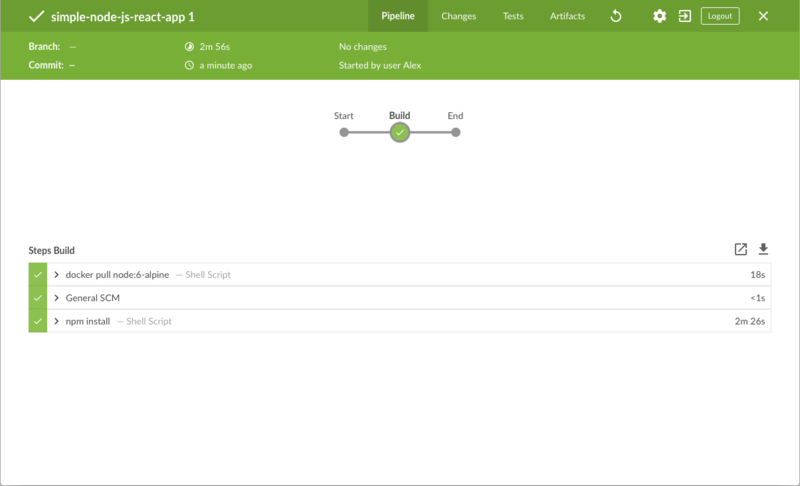 3 Defines a stage (directive) called Build that appears on the Jenkins UI. 4 This sh step (of the steps section) executes the npm command to ensure that all dependencies required to run your application have been downloaded to the node_modules workspace directory (within the /var/jenkins_home/workspace/simple-node-js-react-npm-app directory in the Jenkins container). 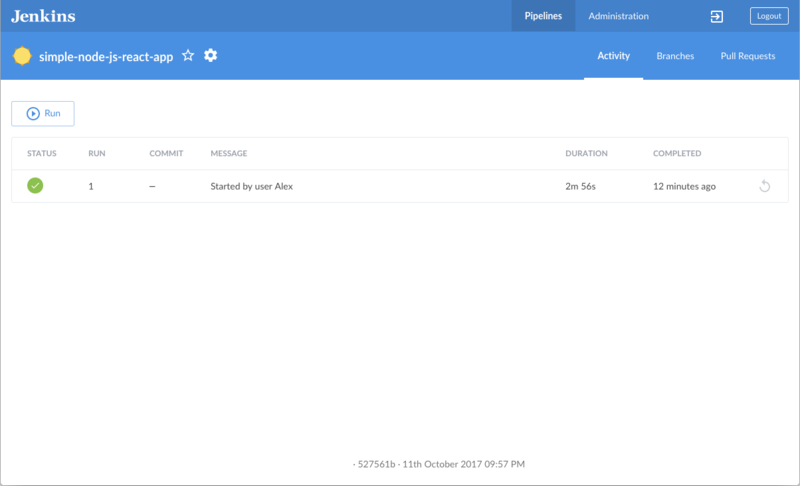 In the This job has not been run message box, click Run, then quickly click the OPEN link which appears briefly at the lower-right to see Jenkins building your Pipeline project. If you weren’t able to click the OPEN link, click the row on the main Blue Ocean interface to access this feature. Downloads the Node Docker image and runs it in a container on Docker. 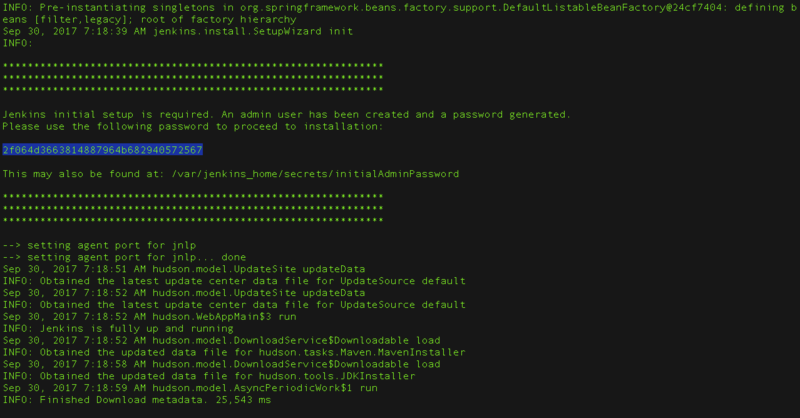 Runs the Build stage (defined in the Jenkinsfile) on the Node container. During this time, npm downloads many dependencies necessary to run your Node.js and React application, which will ultimately be stored in the node_modules workspace directory (within the Jenkins home directory). The Blue Ocean interface turns green if Jenkins built your Node.js and React application successfully. Uncommenting the npm install --save-dev cross-env command in jenkins/scripts/test.sh (to install the cross-env dependency during the Test stage). Read more about this in the test.sh file itself. 2 Defines a stage (directive) called Test that appears on the Jenkins UI. 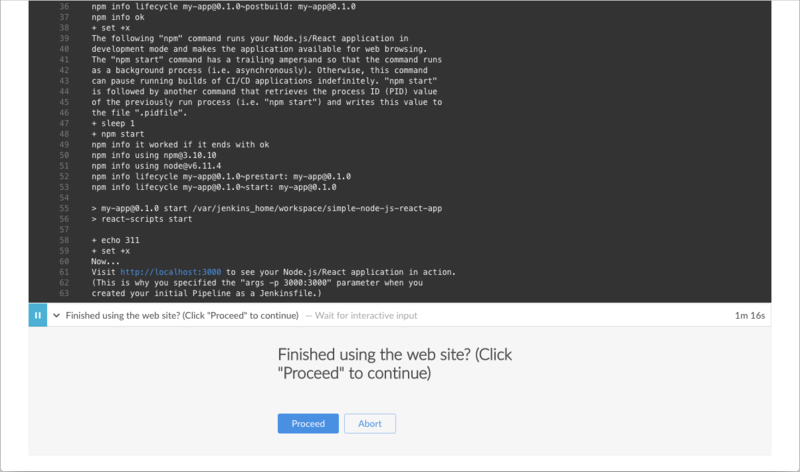 3 This sh step (of the steps section) runs the shell script test.sh located in the jenkins/scripts directory from the root of the simple-node-js-react-npm-app repository. Explanations about what this script does are covered in the test.sh file itself. As a general principle, it’s a good idea to keep your Pipeline code (i.e. the Jenkinsfile) as tidy as possible and place more complex build scripting steps into separate shell script files like the test.sh file. This ultimately facilitates the maintenance of your Pipeline, especially if it gains more complexity. Note: You’ll notice from this run that Jenkins no longer needs to download the Node Docker image. Instead, Jenkins only needs to run a new container from the Node image downloaded previously. Also, from now on, no (new) npm dependencies should need to be downloaded during the "Build" stage. Therefore, running your Pipeline this subsequent time should be much faster. 1 This environment directive might not be present in your Pipeline if you chose to specify the CI environment variable in the package.json file above. 2 Defines a new stage called Deliver that appears on the Jenkins UI. 3 This sh step (of the steps section) runs the shell script deliver.sh located in the jenkins/scripts directory from the root of the simple-node-js-react-npm-app repository. Explanations about what this script does are covered in the deliver.sh file itself. 4 This input step (provided by the Pipeline: Input Step plugin) pauses the running build and prompts the user (with a custom message) to proceed or abort. 5 This sh step runs the shell script kill.sh, also located in the jenkins/scripts directory. Explanations about what this script does are covered in the kill.sh file itself. Ensure you are viewing the "Deliver" stage (click it if necessary), then click the green ./jenkins/scripts/deliver.sh step to expand its content and scroll down until you see the http://localhost:3000 link. Click the http://localhost:3000 link to view your Node.js and React application running (in development mode) in a new web browser tab. You should see a page/site with the title Welcome to React on it. 1 This command provides access to the terminal/command prompt of your Jenkins Docker container. The <docker-container-name> can be obtained using the command docker ps. Otherwise, it would be jenkins-tutorials (if you specified this in the command you used to run this container above - i.e. --name jenkins-tutorials). 2 Once in the container, change directory to the Node.js and React source directory (in the Jenkins workspace directory within Jenkins home). 3 Access, edit and save changes to your application’s App.js file using vi editor. 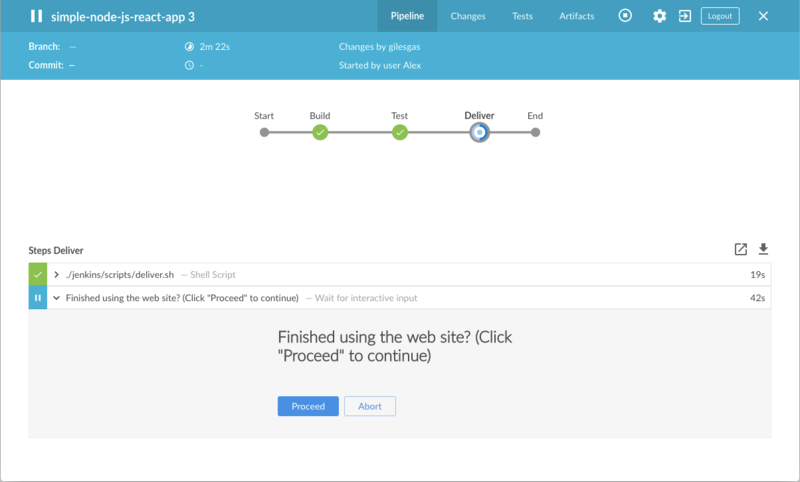 When you are finished viewing the page/site, click the Proceed button to complete the Pipeline’s execution. Well done! You’ve just used Jenkins to build a simple Node.js and React application with npm! 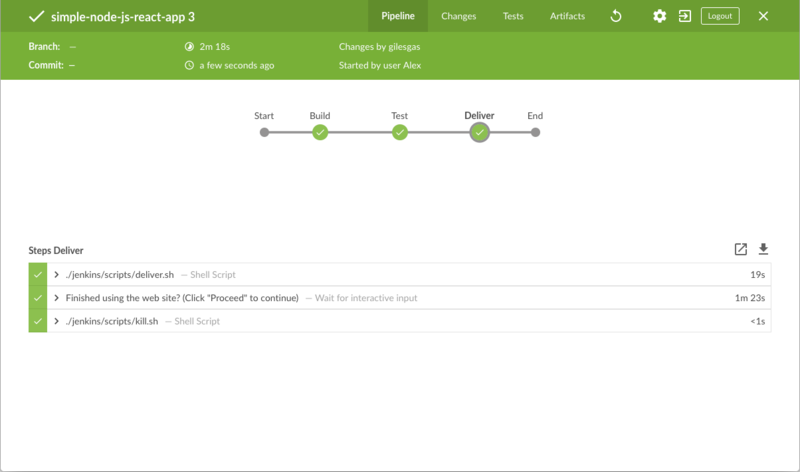 The "Build", "Test" and "Deliver" stages you created above are the basis for building more complex Node.js and React applications in Jenkins, as well as Node.js and React applications that integrate with other technology stacks.